I am stepping away from the Blue Jays beat for a few weeks. I’m heading back to Chicago now that Baby Bastian is starting to figure out where the exit is located and could be showing his face any moment now. So, I won’t be blogging for a while and the updates on Twitter (@MLBastian) will be minimal over the next couple weeks. Catch you down the road…. After Ricky Romero’s outing against the Red Sox on Tuesday, when the rookie left after allowing six runs in just 3.2 innings, Blue Jays pitching coach Brad Arnsberg decided to switch things up for the pitcher. So, Romero listened and skipped his usual between-start mound workout. Instead, he did one light flat-ground before taking the mound again on Sunday. Romero then limited the Angels to two runs over six innings en route to his 11th win of the season. Romero said the lighter work load helped. The young lefty noted that he felt much stronger as the game went on against Los Angeles. Going forward, Romero said he may or may not be throwing bullpens between outings — it’ll depend on how he feels. This week, an off-day on Thursday will help and he is scheduled to make his next start on Saturday — not Friday. That will give him an extra day to rest his arm, which has logged 145.2 innnings between Triple-A and MLB this year. After they pitch on Sept. 4-5, respectively, the Jays plan on shutting rookie lefties Brett Cecil and Marc Rzepczynski down for the season due to innings limitations — roughly 150 for Cecil and 160 for Zep. Romero does not face a similar problem. His career-high in innings is 164.1 in ’08 and he’ll likely fall around 190 this season. That is if Romero averages roughly six innings per start down the stretch. Having 30-40 more innings than the previous season is what the Blue Jays try to shoot for with their young arms (see: Cecil and Rzep). Romero said he feels great right now health-wise and plans on pitching through the end of the year. OTHER ITEMS: The Blue Jays activated LHP Scott Downs from the 15-day disabled list prior to Monday’s game against the Rays and placed Edwin Encarnacion (left hamstring/knee) on the 15-day DL. Downs moves into the bullpen, but might not be used as the closer right away. RHP Jason Frasor has held that role since Downs has been out. … Blue Jays manager Cito Gaston said that ace Roy Halladay will make his next start on Sunday in Boston, giving the right-hander an extra day of rest. One thing that is not settled going into next season is the Blue Jays’ closer role. B.J. Ryan is gone — though his $10 million 2010 salary is still on the books — and the team is not 100 percent convinced Scott Downs will be the full-time replacement. By that last statement, Gaston meant that it’s difficult to simulate a ninth-inning situation in the spring, when most big leaguers have bailed long before the final frame. It stands to reason that Downs and Jason Frasor, who both are eligible to become free agents after 2010, will be the leading candidates for the role next year. Downs has been great over the past few years as Toronto’s main setup man, but his performance as the closer this year — after Ryan was stripped of the role in April before being released on July — has been shaky. Part of the reason for Downs’ struggles, a main reason actually, is he has been dealing off and on with a left foot injury. Gaston does not believe the injury, and the lack of save chances, have really given Downs an opportunity to show if he is the right person for the closer job. Downs, who is coming off a three-outing Minor League rehab stint with Class A Dunedin, was scheduled to rejoin the Jays on Sunday, according to Gaston. The manager said that Downs would “probably” be activated from the 15-day disabled list on Monday, but he might not move directly into the stopper role — currently held by Frasor. Friendly neighbourhood Blue Jays associate reporter Erika Gilbert here, filling in for Jordan while he gets a couple of days off. Travis Snider is hitting ninth again today, after batting sixth on Friday. When Snider got out to a hot start to the season, a lot of fans were hoping he’d get moved up from ninth in the batting order. Given the type of hitter he’s expected to be down the line, a spot in the middle of the order seems to be in his future. Cito Gaston wanted to keep Snider in the nine-hole, though. He didn’t want Snider to feel any extra pressure. Snider was finally moved up yesterday, batting sixth for the first time. Given what Cito had to say about the change in the order in yesterday’s pre-game chat with reporters, it’s not really surprising that Snider’s back hitting ninth. -Jose Bautista has gotten a little less playing time since Rolen was traded, since Bautista used to fill in when the team played day games after night games. Cito said Bautista will probably be getting more playing time down the stretch than he has since the Edwin Encarnacion era began. White Sox manager Ozzie Guillen recently issued a warning, saying his team would retaliate on a two-for-one basis if he believed one of his players was hit intentionally with a pitch. On Thursday, Blue Jays manager Cito Gaston was asked about Guillen’s comments and he had this to say. That being said, Gaston quickly added that he does not agree with the macho-baseball “tradition” of hitting a player with a pitch after somebody launches a home run. On Wednesday night, Jays reliever Brandon League hut Kevin Youkilis one batter after Victor Martinez belted a homer off the pitcher. Home plate umpire Andy Fletcher immediately issued warnings to both the Red Sox and Blue Jays, which was fine with Gaston. The manager just wanted to make it clear to Fletcher and everyone else that League absolutely did not hit Youkilis on purpose. League hit him with a splitter — a dead giveaway that it was not intentional. That is just fine by Gaston, too, because he believes things got out of hand in the past. “You know what? I think it’s better nowadays,” Gaston said. “I used to go up after someone who just hit a home run and get knocked down all the time. To me, I didn’t hit the home run, so don’t knock me down. If I strike out, and I throw my bat at you… you know? “So, I never agreed with all that [stuff] that used to go on about throwing at people anyway. Now, I think they have more of a handle on it and I think it should be stopped. 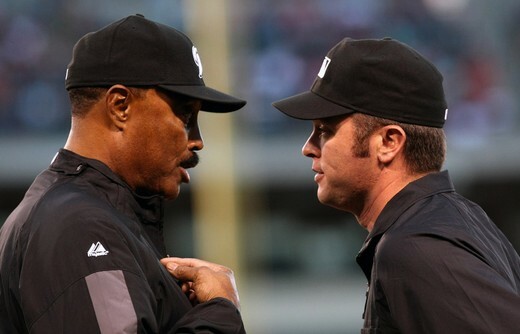 You’re jeopardizing someone’s career by hitting them in the head with a ball and they can’t stand out there and throw a bat at you, so I agree with [the umpires]. One of the areas that the Blue Jays will be re-evaluating this coming winter is the situation behind the plate. Entering the year, the club hoped that catching prospects J.P. Arencibia (right) and Brian Jeroloman would be big-league ready some time this year, or at least by 2010. Given their performance this season, the Jays are now thinking the young catchers might need a little more time. In 96 games with Triple-A Las Vegas, Arencibia has hit .227 with 13 home runs and 54 RBIs, posting a .277 on-base percentage. In 95 games at Double-A New Hampshire, Jeroloman has batted .226 with six homers and 28 RBIs. Jeroloman has reached bast at a .341 clip. This offseason, the Blue Jays will have to decide whether to try to re-sign free-agent catcher Rod Barajas. Backup Raul Chavez is eligible for arbitration. Barajas might seek a multi-year contract and Toronto needs to decide whether it’s willing to do that in light of the development of the young catchers. Come early September, the Blue Jays plan on shutting down rookie starters Brett Cecil and Marc Rzepczynski due to innings limits. Gaston said the club has not decided who will slide into the rotation down the stretch. Brian Tallet will likely be one of the replacements, as he’s been all year, and the Jays will need to look to the Minors for the other. “There’s a good chance” that David Purcey might be one of the guys, according to Gaston. He’s back. After watching box score after box score show that Travis Snider was mashing at a ridiculous rate with Triple-A Las Vegas, the Blue Jays decided to bring the kid back to Toronto on Tuesday. Snider’s production — .337 with 14 homers and 40 RBIs in 48 games for Vegas — might have netted a call-up earlier, but the Jays were keeping a close eye on his service time. Why not? The team is not in the running and holding him back could save millions. By waiting until Tuesday to promote Snider, he will likely fall a few days short of reaching Super Two status after the 2011 season. What this means is he would not have an extra year of arbitration eligibility. It made complete sense for the organization to handle the situation this way. When Snider was up witht he big league club earlier this season, he played against right-handed pitching. Now, manager Cito Gaston said he’ll play against “everybody.” Snider did not like seeing Alex Rios go, but he said he is looking forward to taking advantage of the chance to play in right field on a daily basis. We also chatted with GM J.P. Ricciardi today about the Jays’ unsigned Draft picks. Check bluejays.com later tonight for more on that and for Snider’s comments on being called up. The Jays optioned Joe Inglett to Triple-A to clear room on the roster for Snider.